Over Assassination Attempt on Maada Bio in Kamalo…. The vibrant National Secretary General of the Sierra Leone People’s Party, Lawyer Umaru Napoleon Koroma has called on the APC Presidential Candidate, Samura Kamara to apologise to the nation after the assassination attempt on the SLPP Presidential Candidate, Rtd. Brigadier Julius Maada Bio in Kamalo, the hometown of Samura Kamara. Commenting on the incident, lawyer Koroma said that the APC thugs in Kamalo would have acted on instructions to assassinate Rtd. Brigadier Bio and that Samura Kamara should take responsibility by apologising to the nation. “If Samura Kamara is honest, he needs to tell the public who sent the APC thugs to target the vehicle of Bio with stones and other missiles smashing door mirror. 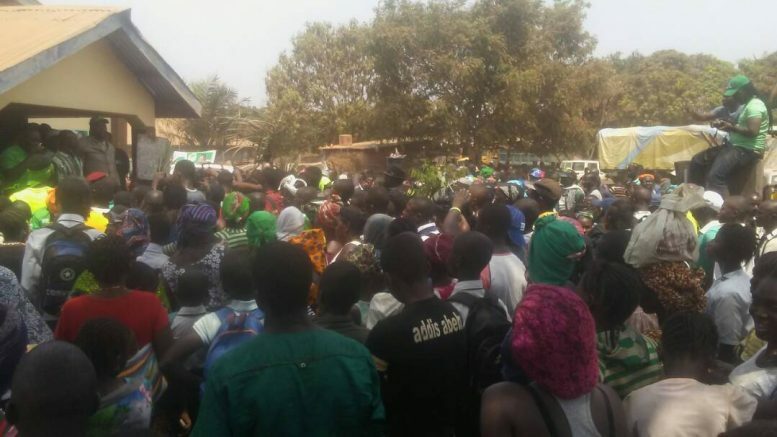 And if Samura Kamara is not capable of controlling APC thugs in his hometown, how can he control APC thugs across the country causing violence and intimidation,” the SLPP scribe stated. Also responding to the Press Release by the APC Secretary on the Kamalo incident, lawyer Koroma dismissed it as mere rambling and the usual evasive approach when APC perpetuate violence. Koroma said that APC cannot run away from their acts of violence. The SLPP Secretary-General went on: “This is not the first time Brigadier Bio has personally suffered from APC assassination attempt. In the 2012 elections, there was also another assassination attempt on Bio by APC thugs in Bo where he suffered severe head injury. Now in the hometown of the very APC Presidential Candidate, Bio has again been targeted for another assassination attempt on his life. I would have thought the APC Secretary-General would apologise for such shameful acts by APC thugs”. Be the first to comment on "APC Samura Kamara Must Apologize"
Think Life Does Not Offer People Second Chances? Think Maada Bio! SLPPNA Regional Executive Inauguration: To Houston, Texas We Must Go!